Forfaits Mobile Orange. This range includes various plans calculated for one month: 2H (120 minutes for calls to other networks + 600 minutes for calls within the network for $5.18), 10H (600 minutes for calls to other networks + 600 minutes for calls within the network for $10.4),12H (720 minutes for calls to other networks + 600 minutes for calls within the network for $15.7), 30H (1800 minutes for calls to other networks for $21), 60H (3600 minutes for calls to other networks for $52). Forfaits Mobile Yo. The range includes three plans: 1H (60 minutes for calls to any numbers for $5.18), 2H (120 minutes for calls to any numbers for $10.4), 3H (180 minutes for calls to any numbers for $15.7). The choice of a prepaid plan depends on the volume of voice traffic that you land through GSM gateways. A good solution will be Forfait Mobile Orange 2H. With this plan, the price per minute of call will be about $0.008. Average voip call rates morocco are $0.19 per minute of call. 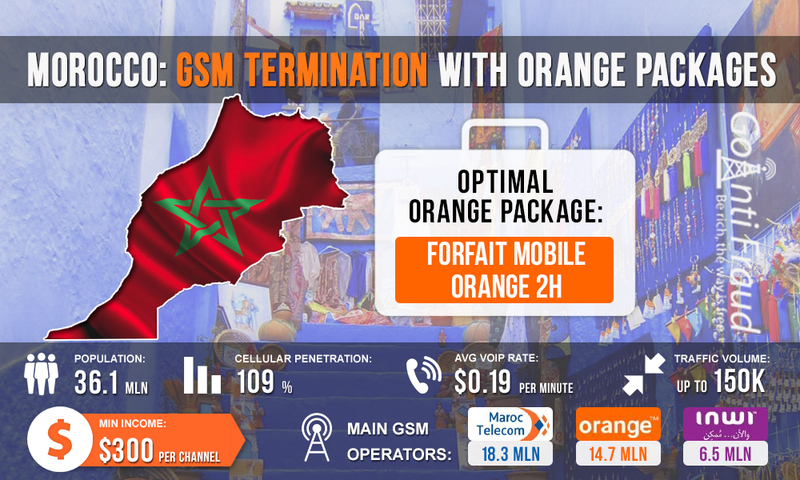 Thus, you get an opportunity to earn more than $900 with the Forfait Mobile Orange 2H plan. Approximate profit is indicated for one channel of the GSM gateway, that is, when using multiport equipment your earnings will increase substantially.